If you haven’t seen my last post, go see it, I gushed about this brand a lot! 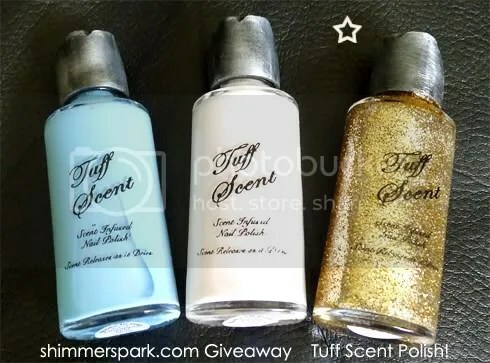 I was going to give away 1 bottle to 2 people, but tuffscent.com was so generous and sent me an extra free bottle, so I’m going to actually choose 2 names and the first winner will get 2 bottles! When you enter, I’m going to ask you what your top 2 choices would be so that when I pick both names, I’ll try my best to send you what you wanted most. I’ll end this one on August 31st. 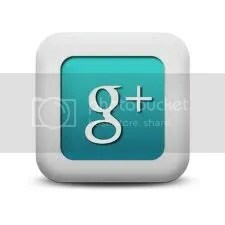 This entry was posted in general polish yumminess, giveaway and tagged blue, creme, giveaway, glitter, gold, guardian angel, nail polish, scented, summer, truth, tuff scent, white, wisdom on August 14, 2011 by hollyshimmerspark. I really only bought these because I had to have the bottles… aren’t those so precious!? Then I was surprised by the polish! I didn’t know this was one of the features but it smells like roses!!! It smells so good! This one is called Snow (or 013). It is a sheer, shimmery white with some flashes of red and I think I notice a little flash of blue too? Even the top of the bottle looks like a rose! This is the 2nd one I got. It is called Sky (or 107). It is blue with glitter and large square chunks of silver glitter too! You can get these online at Urban Outfitters or of course you can search on ebay or for a swap! This entry was posted in general polish yumminess, swatches and tagged anna sui, blue, duochrome, glitter, light blue, nail polish, scented, shimmer, sky, snow, swatch, white on May 28, 2011 by hollyshimmerspark. ManGlaze – Mayonnaise & hot pinks to stamp with! This was some experimenting I did before the french manicure that I posted in my last post! First, I put a layer of ManGlaze – Mayonnaise on, so that I could see what these hot pinks were going to look like over white! Here is a swatch, its a matte white polish with some shimmer! The 3 on the right didn’t work at all (Diamond Cosmetics nail art polish in neon green, Essie – Pink Parka, and Zoya – Lolly)! But all of the ones on the right did! Here they are stamped with the new bundle monster plates! This entry was posted in experiments!, general polish yumminess, konad, swatches and tagged ali, bikini coral, bundle monster, color club, comparison, diamond cosmetics, essie, fauxnad, fucshia, hot pink, illamasqua, insta-dri, kiss, konad, lament, lolly, manglaze, matte, mayonnaise, nail polish, nail stamping, neon, orange you cute, pink, pink parka, psyche pink, raspberry rapture, red, revlon, sally hansen, screamin, shimmer, sonic bloom, swatch, white, zoya on May 11, 2011 by hollyshimmerspark. I had to do a side by side swatch for these because they were so similar! If you put them side by side, you can see that So Many Clowns is a warmer-toned eggshell white and Step Right Up is a very light pink. Both go on like sheer jelly polishes, so I wanted to show you what it looked like with 2 coats and what it looked like with 5 coats. I will probably only keep Step Right Up because if I’m going to wear a sheer jelly white, I’d rather it be pink toned because the warmth of the So Many Clowns kind of enhances the little bit of yellow stain I have from wearing dark polishes a lot of the time. I made Easter cupcakes with the Peeps! I’ll post a picture tomorrow with my comparison of my newest pastel blues! This entry was posted in general polish yumminess, swatches and tagged jelly, nail polish, opi, pastel, pink, sheer, so many clowns so little time, step right up, swatch, white on April 23, 2011 by hollyshimmerspark. I saw the new Spring displays that Maybelline just put out and wanted to swatch the pinks because they both have the hot pink hidden shimmer inside! Pink Halo and Pink Glimpse. Then I grabbed my Zoya – Barbie and Nicole by OPI – You’re an Angel to compare them since they all have hot pink shimmer in them. Since the hot pink shimmer only shows in the sun I had to get that photo in direct sun. It was still hard to show the shimmer inside of Barbie, so now I feel like I don’t like it as much… her hidden shimmer is a little too hidden. This entry was posted in general polish yumminess, swatches and tagged barbie, comparison, hot pink, maybelline, nail polish, nicole by opi, pastel, pink, pink glimpse, pink halo, shimmer, swatch, white, youre an angel, zoya on April 7, 2011 by hollyshimmerspark. I started out with Femme Couture – Garland, like I planned, but using the dotting tool didn’t work out, so I just konad stamped a shamrock in white… then it was kind of too out there white, so I put a coat of China Glaze Emerald Sparkle over it so it just kind of looks lighter green! And more sparkly! ha! What an awkward hand pose to get my thumb corner in there. We’re going to look at an awesome reception venue tonight and hoping that we like it since it is also on the short list of places that are affordable! Then we drink German beers! I got us 3 kinds from 3 places where we drank good beer when we were in Munich. I know its an Irish day, but I shall celebrate it like a German! This entry was posted in general polish yumminess, konad and tagged china glaze, emerald sparkle, fauxnad, femme couture, garland, green, konad, nail polish, shamrock, st patricks day, white on March 17, 2011 by hollyshimmerspark.